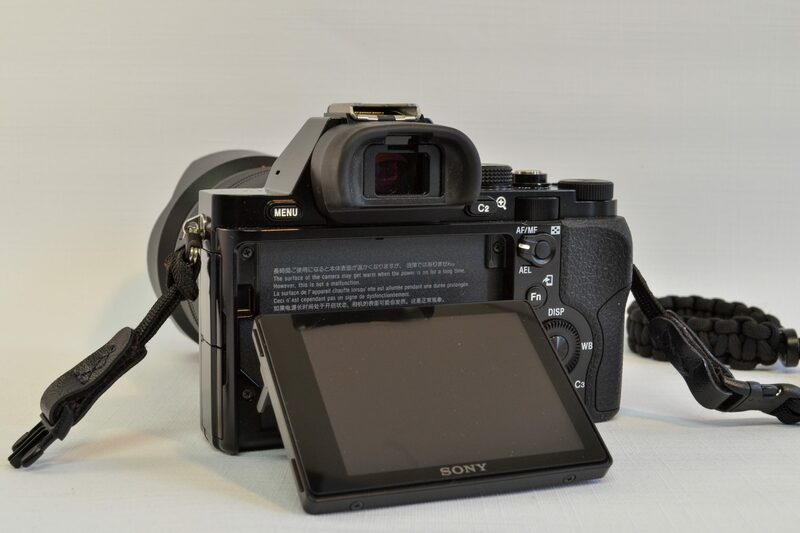 This is a real world user review about the full frame Sony A7 mirrorless camera. The Sony A7 series are the only mirrorless interchangeable lens full frame cameras on the market right now. In the A7 series there are 4 different models, the A7R with the high resolution 36 megapixel sensor, the A7S the low resolution low light photo and video specialist camera, the recently introduced A7 MII with built in image stabilisation and the original Sony A7. In this review I’ll tell you more about the A7 in day to day use from an amateur photographers point of view. So this review is about the original Sony A7 camera (buy it using my affiliate link here: Adorama, Amazon.com or Amazon.de). A camera that has been on the market for well over a year now. Even its predecessor the A7 MII has been on the market for a few months now. So is this camera still relevant? I think it is, for several reasons. The A7 is still available new, and Sony hasn’t officially discontinued the model. And because of the introduction of the new A7 MII the prices of the original A7 have dropped significantly, at the moment you can buy the A7 with the FE 28-70mm f3.5-5.6 kit lens (click here for my review of this lens) for about 1350 euros, and just the body without lens can be found for as little as 1150 euros (prices in the Netherlands april 2015). That makes this by far the cheapest new full frame camera available right now (The next cheapest ff camera is the Nikon D610 which is 1450 euro without lens). Unfortunately the original FE lenses are quite expensive. Because Sony has made the new Sony A7 MII bigger and heavier to fit the image stabilisation the A7 is also the smallest and lightest full frame camera (with interchangeable lens). So to answer my first question: yes, the Sony A7 is still very much relevant in today’s market. 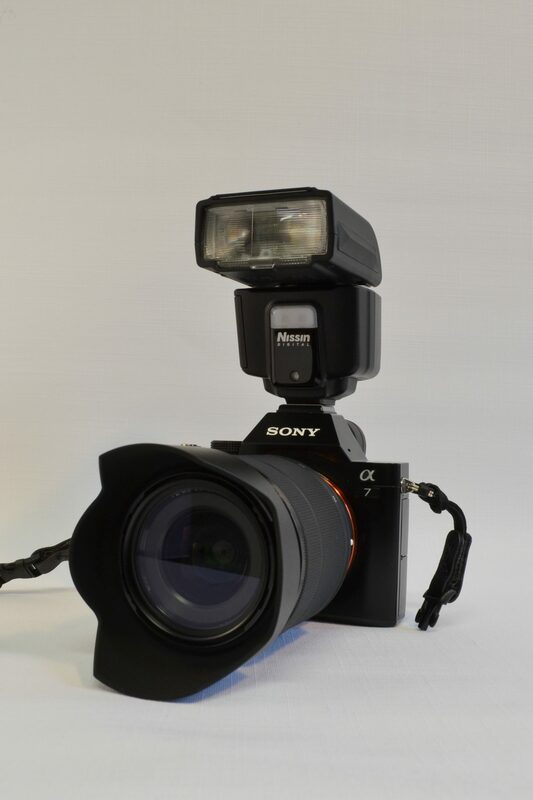 The Sony A7 has got an understated, almost classic, look with sleek and simple lines in a satin black finish. The body itself is very small and thin, being about as wide and deep as the Sony A6000 (click here for my review of the A6000). The total body is a little larger than the A6000 because the EVF of the A7 is built on top of the body. This gives the A7 its distinct look, that reminds me of a smaller version of a DSLR. The housing of the EVF looks a little like the housing of a pentaprism (that this camera doesn’t have of course). Sony added a little ‘bling’ by painting the mount orange. A lot of people don’t like that, but I love the look. 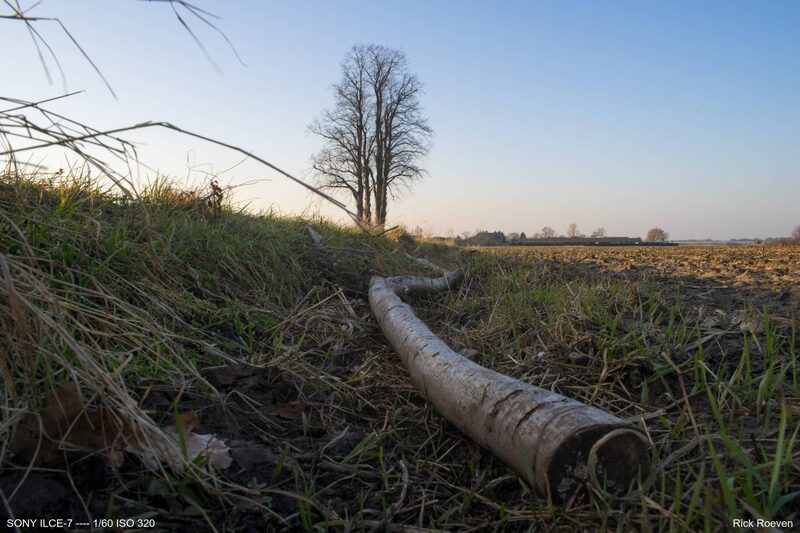 The A7 is weather proofed, but the weather proofing isn’t as robust as some high end DSLR’s. The body is made of a combination of magnesium alloy and polycarbonate. Apparently the body of the A7R, A7S and A7 MII are built completely out our magnesium alloy without the polycarbonate, making them a little more durable. But I haven’t missed the full magnesium alloy body on the A7 since the body feels very well built. The front panel is made of polycarbonate, but this almost feels like metal. All the bodyparts fit very well. On the back of the camera you’ll find the tiltable screen and different control buttons. The layout of the controls is a little different from the A6000, with the biggest difference being the location of the menu button. On the A7 it is located on the left of the EVF, which really took me some time to get used to. Luckily the A7 has got a lot of buttons so you don’t need to use the menu a lot to change your settings. Buttons and dials on the A7 feel very sturdy, with a reassuring ‘click’ when you press them. On the back the A7 has got the same ‘multi-jog’ you find on the A6000. I love the way this button works. It’s got several ‘fast access’ options you use by clicking the dial, like White Balance, drive mode and display setting. When you turn the wheel you can adjust the ISO. Other options are accessed by pressing the FN-button. In the FN menu you can choose which options you want to see and in what order you want to see them, this really helps you personalise your camera. The top of the A7 reveals several dials. As you’d expect there is the PASM dial with a few extra options. In contrary to what you’d expect there isn’t a built in flash unit on the A7, if you need extra light you have to use an external unit (like the Nissin i40, click here to read my review of the Nissin i40). I do really like the exposure adjustment dial on the top, giving you fast and easy access to your exposure. And because it is a marked dial with exposure markings you can check the settings at a glance. The shutter release is positioned on top of the body, a little further to the back than I was used to with other cameras. It does work, but I like the position on the new A7 mII better where it is further to the front and easier to use. On the bottom of the camera you’ll find the battery compartment and tripod mount. 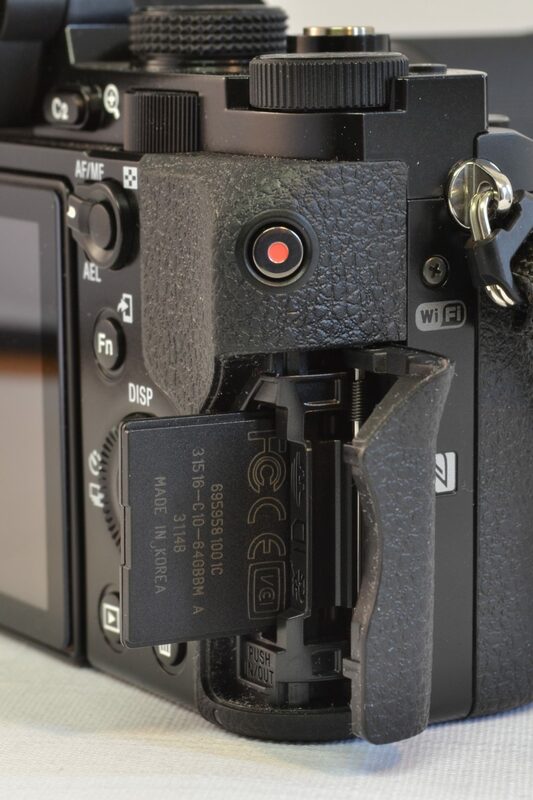 The SD card has got its own hatch on the side of the camera. An advantage for people using the optional grip, so you don’t have to take the grip off to switch SD-cards. The A7 has got a 3 inch screen and a high resolution EVF. The screens resolution is high enough for checking your photos. The screen is quite bright, and can even be used in sunlight. If the sunlight gets too bright to see you can also use the EVF. 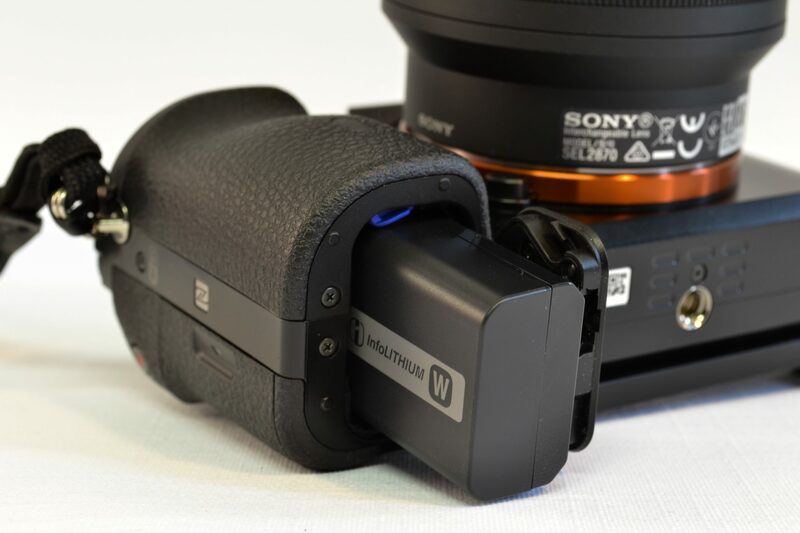 The EVF has got a, kind of sensitive, eye sensor that switches the screen to the EVF if you hold it to your eye. Because it is very sensitive it sometimes switches to the EVF too fast. The EVF has got a very high resolution, and it is very sharp. The refresh rate of the EVF is high enough to give you a smooth image of your surroundings, without the rainbow effect you sometimes get with cheaper cameras. The EVF has got a higher resolution than the one in the A6000, but the difference is smaller than you might think (that says more about the A6000’s EVF than the A7’s). Using the EVF for focusing manual lenses (with the focus magnification) is way better than focusing with an OVF (Optical View Finder, like you find on a DSLR). I also like that you can review your photos without taking the camera off your eye. The EVF (and the live view keeping the sensor live) does use a lot more power. This does lower the battery life compared to a DSLR with a OVF. 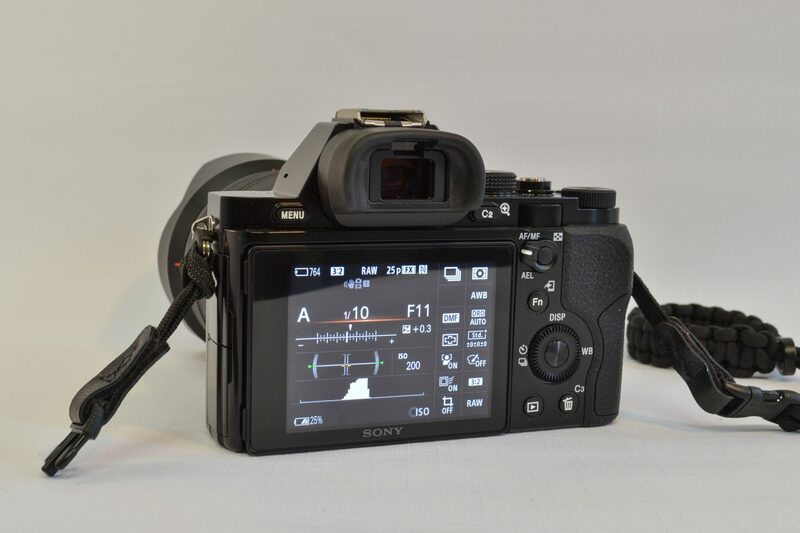 With a typical DSLR you can get more than 1000 shots per charge, the A7 gets about 340 (CIPA standard). In real life you probably get more than that. The battery of the A7 can be charged through the micro USB port. This means you can also charge your battery using about every phone charger you have lying around. 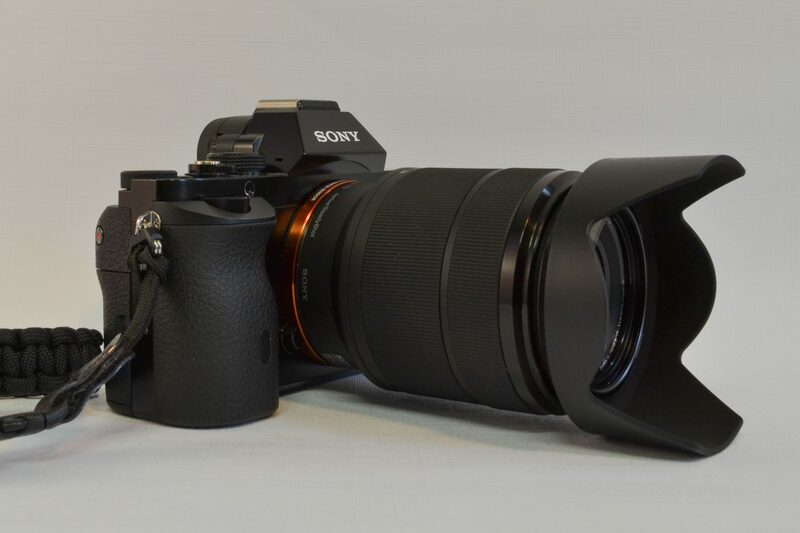 Sony has built one of the fastest mirrorless cameras on the market right now with the A6000. The A7 has got the same kind of focusing system with both Phase Detection AF on the sensor, combined with Contrast Detection. It’s got 117 PDAF and 25 CDAF points, giving it fast and reliable AF. But even with the same sort of focusing system the A7 isn’t as fast as the A6000 or a high end DSLR. The autofocus system does struggle with low light, in very dim situations the focusing slows down and hunts a little more. So with low light it isn’t usable for fast moving subjects, but most of the time it will get the focus right after giving it a little time. The A7 does have the advanced focusing modes you find on the A6000, like subject tracking or Eye AF where the camera finds the closest eye of your subject and focusses on that immediately. The camera doesn’t have the great AF-A function the A6000 does have, where the camera chooses the best focus mode for the situation (choosing between single or continuous itself). That is a shame, so you have to switch to continuous focussing yourself if you want to track a fast subject. Luckily Sony did include the DMF (Direct Manual Focus) where you use AF-S(ingle) to focus and you can make fine adjustment on the fly by turning the focus ring on your lens. All in all the A7 does have a great and very advanced AF system, but it can’t really keep up with the best in class. In day to day shooting the AF is more than capable, but if you shoot sports or other fast moving subjects you are probably better of going for an A6000 or DSLR. The A7 can shoot up to 5 frames per second with AF, which is plenty fast for most situations. The buffer is big enough to keep shooting in continuous mode for quite some time, even in RAW mode. You do have to use a fast SD card, because in 5 fps mode in RAW you are producing about 125 MB’s of data per second. And the camera isn’t accessible when it’s writing data from the buffer to the SD card. The Sony A7 has got all the smart details you get on the APS-C mirrorless Sony models. It has got NFC to link to you phone by touching your NFC equipped smartphone to the side of your camera. After your phone and camera have found each other the connection is built using Wi-Fi. The Wi-Fi connection allows you to send photos to your camera, but you can also use your smartphone as a second screen and remote to take photos or start filming. Sending your photos to the smartphone didn’t seem real useful at first, but it is a great option to share your photos on social media. Also just like the other recent Sony cameras you can install apps from the Sony app store to add functionality. For instance there is a nice Time Lapse app you can use to easily create great looking Time Lapse movies. I almost never use my camera to record video but it is nice to know the A7 can record 1080P movies up to 60p with 28 mbps quality. It doesn’t support the high quality Sony XAVC-S format, so the best you can use is the older AVC-HD format. The A7 has got a full frame 24 megapixel sensor. The sensor Sony uses in the A7 isn’t the newest model Sony has got to offer, there are some newer models like the one Nikon used in the D750 that seem to perform even better. That doesn’t mean the A7 with its older sensor is a slouch, not even close. The A7 performs very well. Noise performance of the A7 is very good, as you would expect for a modern camera with a full frame sensor. 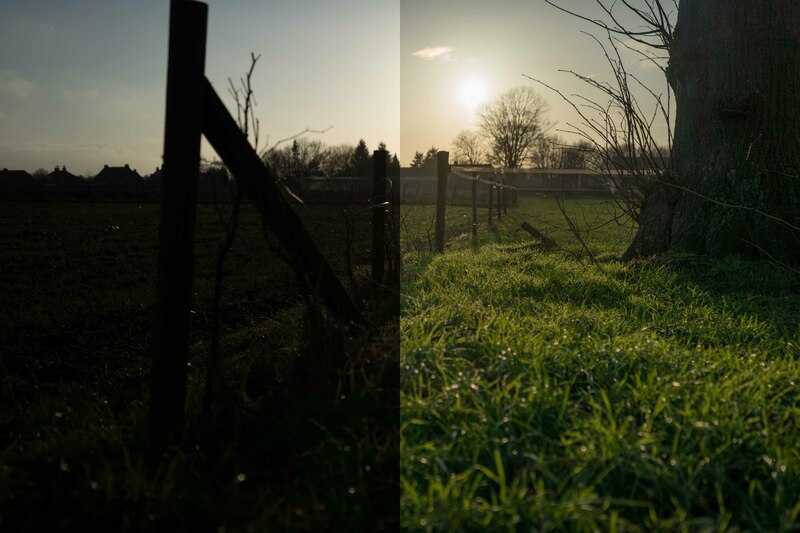 In the following image I’ve compared the A7 to the already very good Sony Alpha 6000. As you can see the A7’s noise performance is about one to one and a half stop better than the A6000. Where I’d advise to stay at ISO 3200 or lower with the A6000 the A7 can handle ISO 6400 without a problem and even ISO 12800 isn’t out of reach if you need the shutter speed. The following image is re-sized and compressed. In my review of the A6000 I was very impressed with the dynamic range of the 24 megapixel APS-C sized sensor it uses. The A7 with the big sensor has got even better dynamic range. The detail you can pull out of dark areas is just about crazy. Check the sample, while it isn’t pretty it does show what this sensor can do. The left part of the photo is the way the camera captured the sunset. The right part is the same photo with the shadows turned up +100. You do introduce noise, but that can easily be fixed in post processing without losing all the detail. I have added some images I shot with my A7 with several different lenses. I’ve used the Sony FE 28-70mm F3.5-5.6 kit lens, and three vintage lenses: the Pentax SMC-M 50mm F1.7, the Panagor 24mm F2.5 and the Minolta MD 135mm F2.8. Exif data is supplied, but the images are resized and compressed. For the full images you can check my Flickr account. I started the review asking if the Sony A7 was still relevant, with the new models Sony and the others are pushing to the market. Although these new models do add new functionality (like built in stabilisation) and even better performance, the good old A7 still quite keeps up. With its low price, high performance and small body it is a great introduction in to the world of full frame photography and it has got the best price / performance you can buy right now. Product images copied from the Sony Netherlands site.